Badminton is an Olympic sport since 1992 with five events. The sport was first played in the 17th century. Badminton World Federation is the highest governing body for the sport. Battledore and shuttlecock is the early version of the game played by the Britishers. The game is also called Poona to refer to the place Pune located in India where it is believed to have been played by the English. Before a shuttlecock was used, balls of wool are used. The game is called as ball badminton. A typical badminton player can cover more than 2 km in just one match. The best shuttles are made from the feathers from the left wing of a goose. 16 feathers are needed to make a shuttlecock. The official game of Badminton was born in a stately home in Gloucestershire, England, home of the Duke of Beaufort. 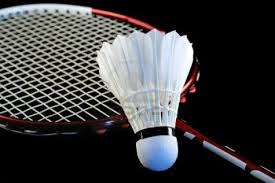 Badminton is the Fastest Racket Sport with shuttle clocking speed in excess of 200 mph. The best shuttlecocks are made from the feathers from the left wing of a goose. The International Badminton Federation (IBF) was founded in 1934 with nine members and now has over 150 members. The IBF is now headquartered in Kuala Lumpur, Malaysia. Badminton was introduced into USA in the 1890s and became popular in the 1930s. Badminton is the second most popular sport in the world, after soccer. Badminton is an Olympic Sport played first in the 1992 Olympic Games in Barcelona. More than 1.1 billion people watched the 1992 Olympic Badminton competition on television. Only 3 countries have won the Thomas Cup since it's inception in 1948: Malaysia, Indonesia and China. Only 4 countries have won the Uber Cup since its inception in 1956: USA, Japan, China and Indonesia. The biggest shuttle in the world can be found on the lawns of the Kansas City Museum 48 times larger than the real thing, 18 feet tall and weighing 2500 kilo. The Thomas Cup, the men's world team championships, has been won by only three countries since it began in 1948 - Malaysia, Indonesia and China. The only time the Uber Cup, the women's world team championships, was won outside Asia was by the USA in 1957, 1960 and 1963; other holders are China, Indonesia and Japan. It is an American, Judy Hashman, who holds the record number of All-England titles 17 in total. Some sources say the game as we know it today took its name from Badminton House in Gloucestershire, England home of the Duke of Beaufort. The two most successful badminton countries are China and Indonesia which between them have won 70% of all IBF events. Crowds of up to 15000 are common for major badminton tournaments in Malaysia and Indonesia.